I’ve had some trouble lately starting and continuing what I had deemed my travel project. I just came back from a 10 day trip to Cape Cod and have very little progress to show. I’m taking on Awry using Habu Paper Linen yarn on #4 needles. My first attempt ended up with being twisted in the round. Yup, after joining 30482309 times in the round, I still make that same mistake occasionally. Worst part is, I had stayed up late to join (probably the source of my mistake) the night before my flight so I had slept only 4 hours before waking up to leave. So I had knit about 9 rounds (and I cast on about 296 stitches) before realizing that fatal error. Of course I was enraged (on a plane) and just slipped off the cord for the provisional cast on AND my circular needles (note to everyone: DON’T DO THAT. the result is a heap of tangled yarn). And so I spent about 3 hours til I landed untangling (then ended up cutting the yarn at the impossible tangle that stripped it of its leaves). I cast on 296 stitches again about 2 days later after I was done sulking (yes, this adult sulks at her knitting). Hopefully the yarn and needles (who I blamed completely for that error) had learned their lesson after that. And they did. 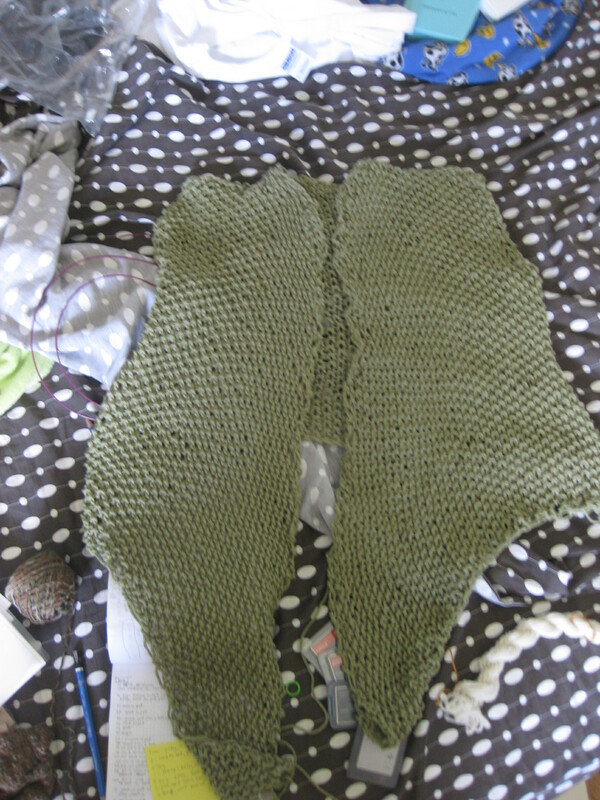 This seemed to be successful, I completed about 4 inches of knitting by the end of my lovely vacation…all seemed well. Then on the plane ride home, I held it up and realized This shirt seems big. Oh gosh…this is double my size. DOUBLE. Let the frogging commence. “Luckily” my flight was delayed a lot. As in 3 hours a lot. So I spent those (trapped) 3 hours frogging and casting on and recalculating. Note the label “attempt.” I haven’t found an error yet. But I have dropped the cord from the provisional cast on once and then realized I should secure it a little better. Luckily I’m on the hem round and so far so good..but I’m not getting too cocky yet. I guess this may have cured my start-itis for now…I’m shooting to finish at least a handful of my current WIPs before starting the Christmas knitting next month. Though this may have seemed to be a nightmare of a problem project, I still love the yarn, love the needles, and love the project. I guess it’s the stubborn-ness in me that keeps me going. Getting a spinning wheel was by far the best purchase I’ve made since graduating. First of all, I’ve found that spinning (on a wheel) is so much faster than drop spindling – though that should have been obvious to begin with. Secondly, the start to finish speed is SO much faster than knitting. But it’s not quite the same finished satisfaction as knitting is, since what I’m left with is raw material for knitting…duh? This is a skein of my first spinning wheel product, a blend of Corriedale and Merino, aqua-white. I blended on my homemade hackle (which is quite ugly, might I add) and my laser cut diz (super awesome!). I had fun taking pictures. My project attention span is at an all-time low. In one day, I’ve found myself working on up to 8 different projects from crocheting to spinning to ink washing to knitting…multiples of some. But I’m starting to feel the finish project itch, you know, the one where you haven’t seen output in a while and want to sit and finish that one thing. Problem is, when you feel the finish project itch at the same time as the start project itch…well then you’re pretty much digging yourself into a bigger hole since finishing takes much longer than starting, and well I don’t swatch but I start…all the time…and you can tell where this is going. Throw my senior project booklet (which is required for my elusive diploma) and portfolio into the mix and I’m in a chaotic mess. Any suggestions for curing one – or the other? The Romney roving I got from Hawaii appears to be eating the Romney locks from Woods Hole, Massachusetts (where I’ll be going next week!). I’m spinning them together (first carding them) to be a delicious deep aqua/turquoise with just the right amount of brown…it’s so rich and delicious! Pictures to be posted in a bit! Yay, spinning!